Marilyn Iverson Obituary - Oak Harbor, Washington | Whidbey Memorial Funeral & Cremation Service, Inc.
Joy (Thrailkill) Iverson, 85, of Coupeville, WA, passed away peacefully in her sleep at Regency on Whidbey on April 5, 2019. Born in Seattle, WA on April 20, 1933, she graduated from Lewis and Clark High School in Spokane, WA, and the University of Washington. 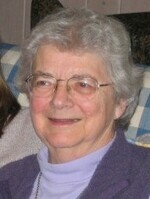 After majoring in Education in 1955, she taught physical education for the Bellevue, WA School District 1958-1961. Joy and Sidney C. Iverson married in 1960 and moved to Bellevue, WA to raise their family. Following retirement, Joy and Sid moved to Whidbey Island, WA. Joy loved sports and found great pleasure both playing, and coaching club, junior and senior high soccer, volleyball, badminton, and bowling in a Bellevue women’s league. She also enjoyed volunteering her time through local organizations, including Campfire Girls, Sons of Norway, Washington Special Olympics, Marymoor Museum, and Island County Historical Society Museum. Joy is survived by Terri Iverson, Seattle, WA; Scott Iverson and TeriAnn Davis, of Whidbey Island, WA. Her family includes sister Karen Ocheltree and husband, Gary, Spokane, WA; brothers Donald Thrailkill, Bayview, ID, and Don Cummings and wife, Carol, Ellensburg, WA; uncle Walt Thayer, Bothell, WA; sister-in-law Marli Iverson, Mercer Island, WA; nephews Jans Iverson and wife, Andrea, Mercer Island, WA, and Dane Iverson and wife, Brandyn, Orinda, CA, and cousins Rebecca Thayer, Seattle, WA and Rex Thayer, Bothell, WA. Arrangements have been \made with the assistance of Whidbey Memorial Funeral and Cremation Service.